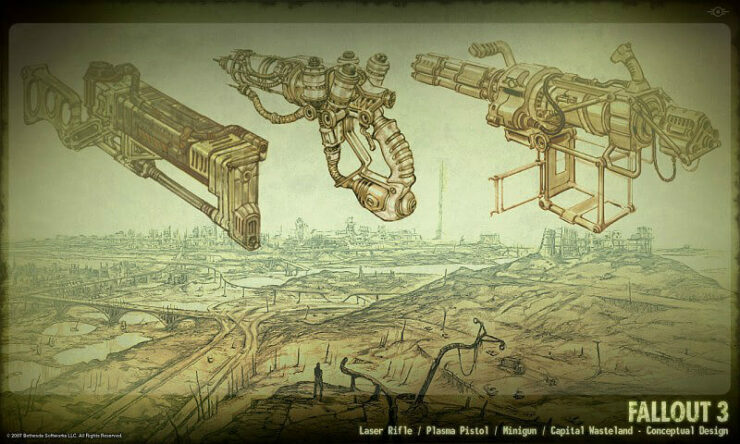 This will be my top 10 favorite Fallout 3 weapons in order of usefulness/preference. In order to keep it simple, I am only listing weapons from the base game and excluding weapons introduced in DLC. Most of these weapons have a unique counterpart which will be named after I give a little info on the weapon and why it’s my favorite. Take this as a list of useful weapons for beginners. Background: The Mesmetron is an experimental pre-War “non-lethal pacification” weapon that was being tested in the months immediately preceding the Great War. It operates by sending a signal pulse into a human target’s brain that scrambles higher-level mental functions, leaving the target extremely susceptible to suggestion. Still in its testing phase, the weapon was found to have the potential to trigger two undesirable side-effects: extremely increased aggression, or spontaneous cranial eruption. 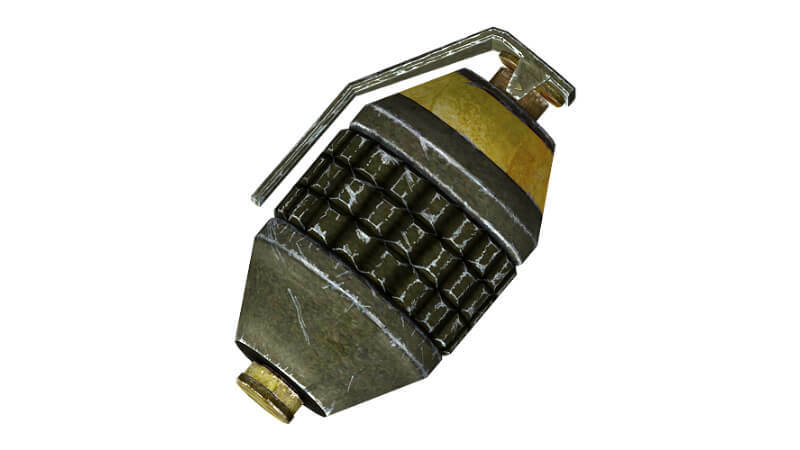 Background: Frag grenades are standard grenades creating an explosive blast and dealing significant damage, with a high chance to cripple limbs. It seems to have the same blast radius as its more powerful energy-based variant, the plasma grenade. 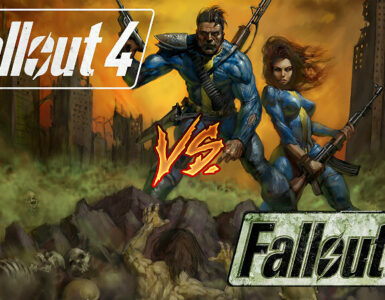 They are commonly used by melee-equipped raiders and super mutants when they are out of melee range. Slendy’s opinion: Frag grenades are something you want on you at all times. When facing a raider encampment, it’s simple to just toss a few in to soften their numbers and cripple their limbs. On top of that, frag grenades, as well as frag mines, are easy to come by, and can be a great way to even out a barter, as they have a fairly high value. Background: These weapons are remnants from the United States’ war with China, an event that triggered the Great War. They were most likely brought back by American soldiers fighting in various campaigns in mainland China or were brought by Chinese infiltrators and saboteurs like the ones at Mama Dolce’s and elsewhere throughout the United States. Background: This sniper rifle is an older model of the famed DKS-501. Chambered for .308 ammunition, it’s also extremely fragile and requires regular repair and maintenance to keep it in working condition. The sniper rifle is the top-tier long-range weapon. It has a scope and deals much more damage than the hunting rifle, but has a very rare ammunition type and is a very fragile gun. Unique variant: Victory Rifle, Reservists Rifle. 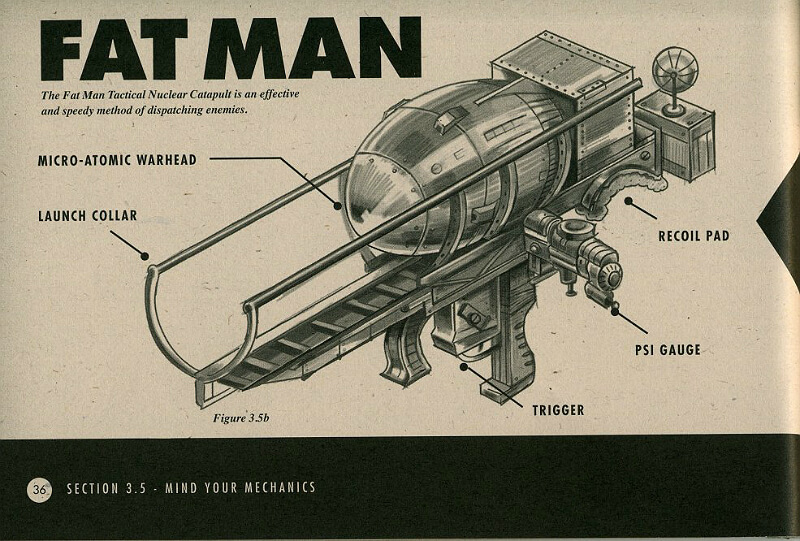 Background: The Fat Man is a pre-War heavy weapon that launches mini nukes. The mini nuke projectile is very heavy, and if simply fired straight ahead, it will travel only a short distance before falling to the ground and detonating (causing you to be caught well within the very damaging mini-nuclear blast). The Fat Man has an estimated range of 150+ yards. 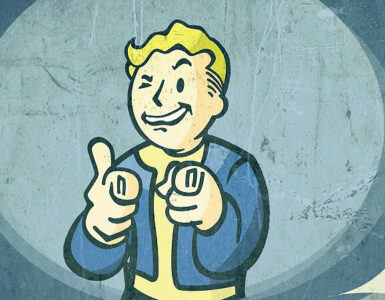 The blast zone will be irradiated for a short time after detonation, giving out up to 5 rads/second. 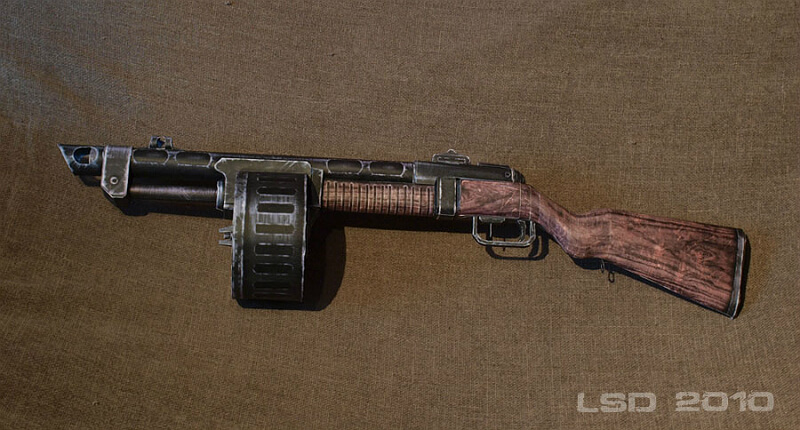 Background: This model of combat shotgun was deployed as a close assault fire team’s primary weapon (supplemented with explosives, an N99 pistol, and a power fist) during the Anchorage Reclamation, and many working units have been scavenged by raiders, slavers, and Talon Company mercs in the Capital Wasteland. Vastly superior to the sawed-off shotgun, the combat shotgun combines a large drum magazine with mutilating close-range damage. The only drawback is the weapon’s poor reliability, as the combat shotgun deteriorates quickly. However, considering it is commonly used by human opponents, and its use in traps, you can usually find enough to keep at least one in fully working order. Background: The weapon fires darts that have been dipped in radscorpion venom. A hit anywhere on a target’s body will instantly cripple the legs, making it extremely useful against fast melee opponents such as deathclaws, yao guai, feral ghoul reavers, super mutants, and aliens. Surprisingly, the poison from the dart does affect radscorpions; however, it does not hinder the radscorpion’s speed as dramatically as it does other enemies. After the initial hit, the darts inflict additional poison damage upon the target for 8 seconds unless the target is non-organic, such as a robot, in which case the poison will do no extra damage. The poison damage effects of the dart do stack; more darts in the target at once will cause it to lose health at a faster rate. Background: The alien blaster is one of the most powerful weapons in the game because a critical hit is guaranteed. 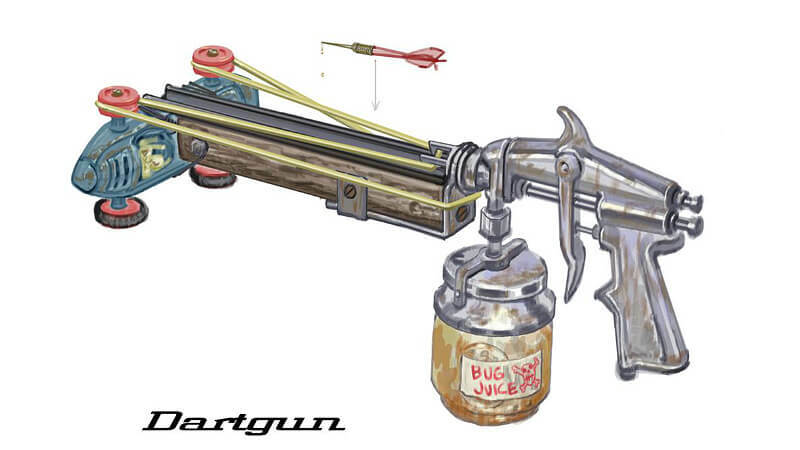 This weapon will often be able to take down any foe with a single shot to the head. This weapon also has the effect of disintegrating any enemy killed with a critical shot by it (which is every shot for creatures weaker than most super mutants), identical to a laser (with the exception that the disintegration effect is colored blue instead of red). Background: The Type 93 Chinese assault rifle was designed and manufactured by a Chinese industrial conglomerate for the People’s Liberation Army during the Resource Wars, for the purpose of equipping the Chinese infiltrators and American fifth-columnists. To this end, it was chambered for the abundant 5.56mm round and utilizes a 24-round magazine. Thousands of these weapons were smuggled into the US for use by Chinese operatives and sympathizers on the East Coast, and many remain functional even two hundred years after the Great War. These rifles are also proven to be ready for manufacturing in post-War conditions. Unique variant: Xulanlong Assault Rifle. 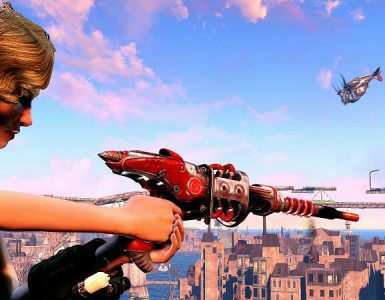 Background: This weapon is often the very first rifle type firearm the Lone Wanderer can acquire after leaving Vault 101 for the first time. (Although the BB gun is the first rifle to be acquired, the .32 hunting rifle is among the first actual combat rifles that are able to be acquired.) This weapon is very accurate, and has the best zoom of the non-scoped weapons. The standard hunting rifle has spread, unlike the sniper rifle (and the hunting rifle’s unique variant Ol’ Painless). This can make the weapon hard to use for sniping at long ranges without V.A.T.S. A skilled player can use this weapon to great effect in most situations, even close quarters combat inside buildings. As always, it is best to take cover between shots.